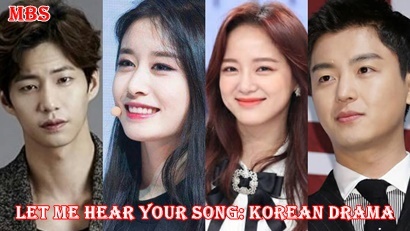 The latest Korean Drama series “Let Me Hear Your Song (너의 노래 를 들려줘)“, aired starting in July 2019 on the KBS2 channel and starring a series of top Korean artists. Actor Yeon Woo-Jin was the main character, he was previously known to star in the OCN drama “Priest” in 2018. Then his acting in Let Me Hear Your Song (너의 노래 를 들려줘) opponents are the beautiful and famous actress Kim Se-Jeong, a popular K-pop member “Gugudan” known as Ra Eun-Ho in the Korean drama “School 2017”. Actor Song Jae-Rim and actress Park Ji-Yeon from K-pop “T-ara” also became the second main player in the new KBS2 2019 Korean Series. This romantic comedy drama series that blends with the mystery was worked on by PD Director Lee Jung-Mi, He was assisted by writer Kim Min-Joo. The Korean Drama Let Me Hear Your Song (너의 노래 를 들려줘) was broadcast on KBS2 every Monday and Tuesday at 22:00 local time, replacing the previous drama series “Perfume” which aired in June 2019. Alright, just listen to the full Synopsis of Let Me Hear Your Song. The murder incident occurred and a man named Hong Yi-Young, played by Kim Se-Jeong, was a drummer not remembering what happened on the day of the murder. He is simple-minded and has insomnia. Then Hong Yi Young looks for work. He meets Jang Yoon played by Yeon Woo-Jin. He sang badly, but a pianist in the orchestra. To help insomnia on Hong Yi-Young, Jang Yoon finally calls him every night. They tried to find the truth about the murder. Meanwhile, Nam Joo-Wan (Song Jae-Rim) is an orchestra conductor. He has charisma and showmanship. Ha Eun-Joo (Park Ji-Yeon) is a violinist in the orchestra. He is very arrogant.